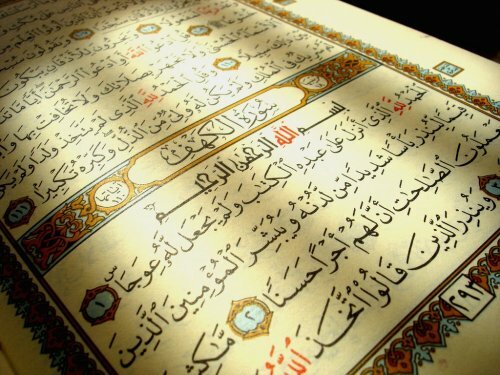 The Qur’aan is the Speech of Allah (The Mighty and Majestic). It is not a creation. It was delivered by the angel Gariel to Muhammad (peace and blessings be upon him), who would memorize the verses he received, recite them to the Companions who happened to be with him and order them to write it down immediately. Muhammad (peace and blessings be upon him) used to keep a copy of the revealed portions in his house. It is the last of Allah’s Books, which was revealed in installments over a period of twenty-three years. It is divided into 114 suwar (sing., soorah, meaning Chapter) of unequal length. It is one of the fundamental sources of Islamic legislation and teachings. Some of its chapters were revealed in Makkah, and the rest were revealed in al-Madinah. The Makkan chapters and verses are concerned mainly with issues of ‘Aqeedah (creed, belief) such as monotheism (tawheed), the signs of existence of Allah (The Exalted, The Supreme), Resurrection, the life after the death and the Day of Resurrection. The Islamic creed places the greatest emphasis on the Oneness of Allah (The Mighty and Majestic) without any partners in worship, and it is the focal point of the message with which Allah (The Mighty and Majestic) sent all the Prophets and Messengers to mankind, beginning with Adam and ending with Muhammad (peace and blessing be upon him). The chapters revealed in al-Madinah are concerned with acts of worship and actions related to all aspects of life and their permissibility (halal) or prohibition (haram). The verse is in fact a challenge to mankind and everyone is obliged to believe in the miracles of this Qur’aan. It is a clear fact that more than 1400 years have elapsed and not a single word of the Qur’aan has been changed, although the disbelievers tried their utmost to change it in every way. But they failed miserably in their efforts. As it is mentioned in this holy verse, “We will guard it.” By Allah! He has guarded it. On the contrary, all the other holy books (the Tauraat (Torah), the Injeel (Gospel)) have been corrupted in the form of additions or subtractions or alterations in the original text. It will be so preserved until the Day of Resurrection. Muslims today read and recite the Qur’aanic text that was read and recited during the lifetime of the Prophet Muhammad (peace and blessings be upon him) and his Companions. Not a single letter has been added to the Qur’aan or deleted from it. Undoubtedly what is meant by the Word of Allah here is the Noble Qur’aan. So the Qur’aan is the Word of Allah in both wording and meaning. Allah spoke it in a real sense and gave it to Jibril (peace be upon him) the trustworthy, then Jibril brought it down to the heart of the Prophet (peace and blessings of Allah be upon him), so that he might be one of the warners, in a plain Arabic tongue. The Salaf believe that the Qur’aan was revealed; Allah, may He be glorified and exalted, revealed it to Muhammad (peace and blessings of Allah be upon him) piecemeal, i.e., bit by bit, over twenty-three years, in accordance with the wisdom of Allah, may He be glorified and exalted. Moreover, some of the revelation was revealed for a specific reason for which it was sent down, and some of it was revealed without a specific reason. And some of it was revealed to tell of something that happened to the Prophet (peace and blessings of Allah be upon him) and his companions. Some of it was revealed concerning shar‘i (legal) rulings, according to what the scholars have said concerning this matter. Then the Salaf say that the Qur’aan is from Allah in the first place and it will return (to Him) at the end of time. This is the view of the Salaf concerning the Noble Qur’aan. It is clear to us that Allah has described the Noble Qur’aan in superlative terms. He has described it as wise (hakeem), noble (kareem), great (‘azeem), and glorious (majeed). These qualities, in terms of which Allah has described His Book, may be attainable by one who adheres to this Book and acts upon it both inwardly and outwardly. Allah will give him some share of glory, greatness, wisdom, honor and authority that is not given to the one who does not adhere to the Book of Allah, may He be glorified and exalted. Hence I call all Muslims, rulers and ruled, scholars and ordinary folk, to adhere to the Book of Allah, may He be glorified and exalted, both inwardly and outwardly, so that they may attain honor, happiness and glory, and prevail in the east and in the west.